City Solicitor Andre Davis and representatives from Democracy Forward announce their lawsuit against the Trump administration. Baltimore City sued the Trump Administration in federal court Wednesday for changing immigration policy without notice. The policy could have a direct impact on more than 45,000 immigrants and their families living in the city. 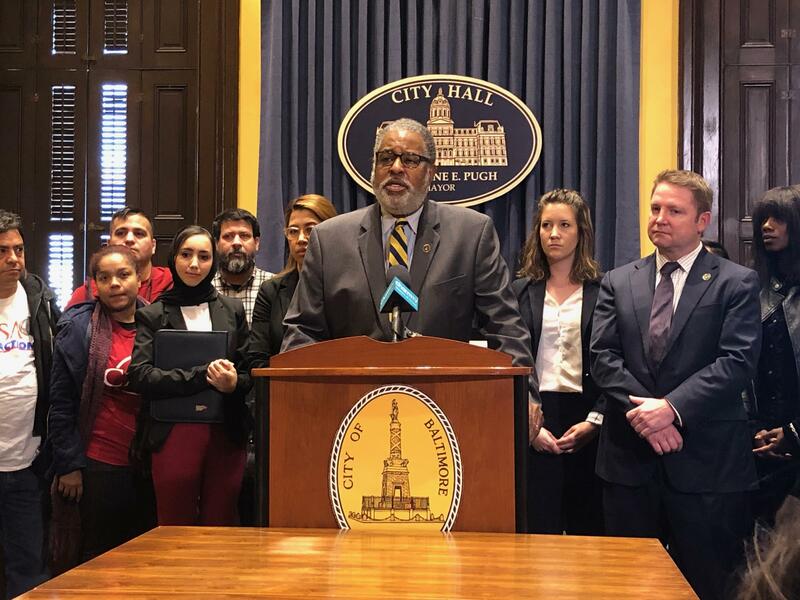 City Solicitor Andre Davis along with Democracy Forward, a liberal leaning lawyers’ group, announced the suit at a City hall news conference saying the city wants to hold the Trump Administration accountable. “Baltimore city has not chosen to sit by idly as this administration has behaved lawlessly, and without regard to settle legal norms, political norms and frankly moral norms,” says Davis. The suit charges the Trump administration changed the policy for U.S. visa applicants in January without prior or notice or explanation, violating federal laws that govern administrative agencies. The policy now allows State Department officials to consider whether applicants or their family members are receiving, or will need to receive, non-cash benefits such as food stamps, public health vaccinations, and Head Start. Ultimately John Lewis, legal counsel for Democracy Forward says this will factor into whether or not the applicant can come or stay in the US. “We argue in the complaint and set out in detail the administration’s changes are motivated by hostility and animus towards immigrant communities,” says Lewis. Lewis says these benefits aren’t meant for immigrant families to rely on exclusively, but to provide a little extra help. “And importantly, these are benefits all immigrants are eligible to receive under the law,” says Lewis. Catalina Rodriguez-Lima, head of the mayor’s office of immigrant affairs, says she has seen the effects of the change already. African immigrants have stopped applying to the city’s Head Start program out of fear their relatives won’t be able to come into the country. “Immigrants are more than a subsector of our city. They make up our businesses, our schools, and our communities,” says Rodriguez-Lima. Former US Attorney General Jeff Sessions said during a December 2017 visit to Baltimore the administration wanted to end a system that allows immigrants to bring in family members and replace it with a merit based system of immigration. Lewis says other cities may join the suit.